Florida: Voters adopted two far-reaching amendments. What will be their impact? Referendums: 15 states voted on criminal justice issues. Here are the results. You can visit The Appeal: Political Report’s website for information about each individual election we tracked this fall, and for other features like a map of recent reforms. In separate interviews on Monday, Proehl-Day and Williams detailed some of the difficulties they experienced running for prosecutor on such a platform. “We struggled to get anybody to care about the DA race,” said Williams, who is a Democratic state representative. “Ninety percent of my campaign was actually an education about what a DA is, what a DA does… [It was] not uncommon to hear, ‘I’ve never been arrested, why do I care, how does this impact me?’” He added that he was hampered by a parallel indifference among the people in a position to help financially. “There isn’t a built-in pipeline fundraising for DA races,” he said, contrasting his experience in this election with his past legislative races. Proehl-Day and Kunzweiler indeed clashed over prosecutorial discretion. After Proehl-Day said that she would decline to prosecute marijuana possession, Kunzweiler denounced her stance. “That’s not what a DA does, DA’s job is to enforce the laws,” he said. But in a new interview in the New Yorker, Kunzweiler describes his role as going beyond the rigid application of laws, extending it to include “teach[ing] people the morals they either never learned or they somehow forgot.” To illustrate how he makes calls about how to punish defendants, he compares prosecution to disciplining children. “There are times when your kids need a lecture, times when they need a grounding, and times when they need a spanking,” he said. Proehl-Day listed ways in which Kunzweiler does much more than merely apply the law. “Overcharging, undercharging, those are all discretion,” she told me. She pointed to his efforts to “thwart” a recent reform that voters adopted to reduce drug sentencing by upping the charges he files. But Proehl-Day also described feeling partially boxed in by his rhetoric. “When he frames it that way, I come across looking like an activist,” she said. The claim that prosecutors’ political preferences are irrelevant to their function also obfuscates the lobbying role that the Oklahoma District Attorneys Council has played by speaking out against legislative reforms. Williams noted that the group has “time and time again” watered down or impeded legislative deals; he said that he ran to be a “counter-lobby” to the council. Prosecutors coming together to organize against legislative reforms is a pattern that recurs across the country. The chamber shifted considerably last week. Democrats have won at least 50 more seats in the House than what they had in April (175), according to provisional results. To be sure, some new Democrats will most likely oppose abolition and some of the defeated Republicans supported it. But Democrats were still far more likely to support abolition in the past: In the House vote in April, 83 percent of all Democrats and 47 percent of all Republicans voted to abolish the death penalty. If the incoming House splits along similar lines—an uncertain proposition—that would suffice for abolition. When asked about the chances for reform in the next session, Dumais estimated that there was a “90 percent chance if not better” that the House could override a veto. But he also warned that the chamber just saw a lot of turnover. “We’ll have to do a lot of work,” he said. One uncertain question regarding Amendment 4, according to Sam Levine of the HuffPost, is whether people will need to have paid all of their legal fines and fees before their rights are restored; some other states impose such a requirement to exclusionary effects. “These are indigent people and the fines and fees are quite excessive, so it doesn’t get paid,” Marc Mauer, executive director of the Sentencing Project, told Levine. “Typically, if you abide by the other conditions of probation, then they just ignore the fines and fees.” The HuffPost article, as well as a new Think Progress story by Kira Lerner on the ramifications of Amendment 4, details other obstacles to an efficient and far-reaching implementation of Amendment 4 such as the degree of clarity and information the state will provide to newly-enfranchised individuals. This has posed problems elsewhere recently, including in Alabama and in New York. 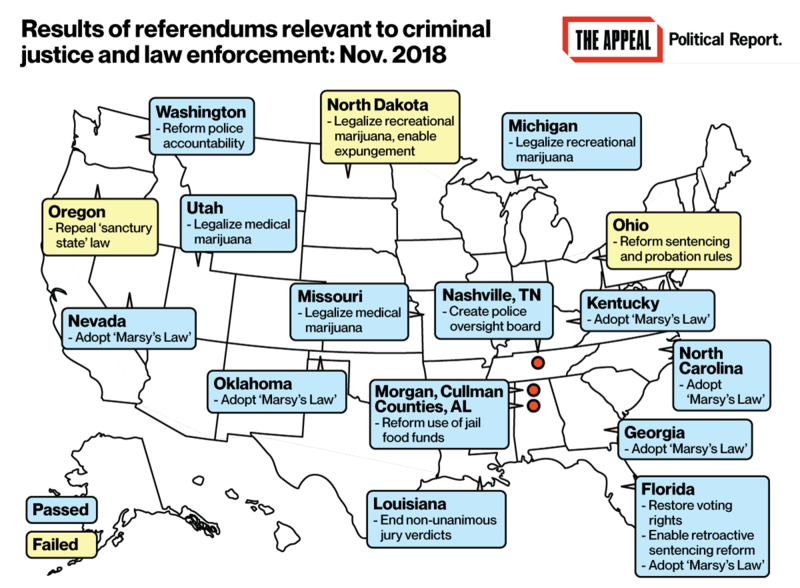 At least 15 states held ballot initiatives on measures relevant to the criminal justice system and law enforcement practices last week. Louisianans barred non-unanimous juries from delivering guilty verdicts. Non-unanimous juries were enabled in Louisiana’s 1898 Constitution as a way to circumvent the inclusion of Black jurors. They produced higher rates of conviction in Louisiana, and disproportionately affected African Americans. Oregon is now the only state to allow non-unanimous jury verdicts, and since Louisiana’s vote Oregon leaders (including the state House majority leader and the district attorney of Multnomah County) have already been talking about reform. The Appeal: Political Report will look more deeply into reform prospects in Oregon in a future newsletter. An electoral setback for criminal justice reformers was the failure of Ohio’s Issue 1. It would have downgraded possessing any drug to a misdemeanor; it also contained other decarceration provisions. Elsewhere, Washington State and Nashville, Tennessee strengthened independent investigations into police shootings. Michigan voters legalized marijuana for recreational use, and Utahns and Missourians legalized medical use, though North Dakotans rejected a measure to legalize recreational marijuana and expunge past convictions, as I detailed last week. And voters in six states approved Marsy’s Law, which Melissa Gira Grant reported on last week in The Appeal. Abraham Gutman of the Philadelphia Inquirer looks at the criminal justice referendums on the ballot nationwide this year to outline reforms that Pennsylvania should adopt. He argues that the state should fully decriminalize marijuana, expand its expungement process (as North Dakota is considering), and abolish life without parole sentences. As a vehicle to advance that last goal, Gutman points to legislation that state Senator Sharif Street introduced in September; the bill “would make it possible for those sentenced to life imprisonment to eventually have an opportunity for parole in Pennsylvania,” according to Street’s description.